The first league gala of the season saw Portland getting off to a flying start! Swimmers achieved numerous PBs and first swims and a special note of praise for our very youngest swimmers who took part, many of whom were swimming at a gala for the first time. Swimmers who we asked to ‘swim up’ age groups rose to the challenge and performed really well. Matt’s training regime is definitely paying off! 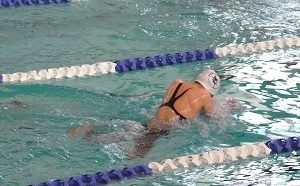 Mai Drury swam a PB in 100m IM. Efan Drury swam two PBs, taking him close to County qualifying times. Raj Malhi, Judd Tucker, Harrison Morroll and Chloe Matthews all achieved County qualifying times or close to them with their swims. Tilly Matthews swam hard in the 100m Freestyle, gaining a new PB for her efforts. Beatrice Munro and Edward Roberts both maintained their energy for three individual events, achieving County times in all three. Stanley Toplass achieved two new PBs and is nearing a County time in the 100m backstroke. Gaby Marriott achieved new PBs and County times in both of her events. Our Masters swimmer Jonny Higham powered off the blocks and eased to victory in the Open 100m Fly. Coleby Adkin was fantastic at keeping her cool, despite technical difficulties with the blocks, and went on the complete her first gala event with an impressive time. Lucy Waller, Issy Boydell and Angelina Giannino all showed great stamina, drive and focus, achieving PBs in their individual events. Saki Kamura was undaunted by this being her first UK gala, having only arrived from Japan a few weeks earlier, and performed well in her events, cheered on by the rest of the Portland team, who were excited to welcome her into the Club. Saki, along with Monty Trott, Harry Thompson and Amy Hough worked together to put in strong performances in the ‘9 and under’ freestyle and medley relay events. Gabriel DiFolco-Brooks, Lucian Munro, Briony O’Keeffe and Bethan Simmons gave strong swims in their individual events, as well as making enthusiastic contributions to Portland’s credible performances in the relays. Head Coach Matt Price was a fantastic role model for the swimmers, swimming with commitment in the open relays and cannon. The cannon completed a great evening, to much encouragement and cheering from the whole Portland Team. Many thanks to the parent volunteers and coaches who helped on the night. Overall, it was a great way for Portland to begin the new season. Well done to everyone who took part! Log in and go to Swimmers’ Corner for the times.